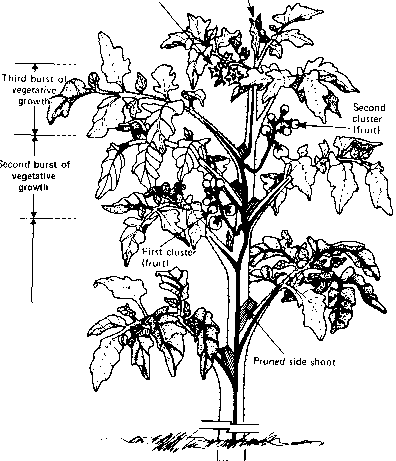 The tomato truss is composed of a succession of axils, each bearing a single flower (Fig. 5). The main stem of the truss (peduncle) is capable of branching one or more times; such branched (or double) trusses can be encouraged by low-temperature treatment, a procedure discussed later. Branching is desirable because it usually increases the number of flowers per truss and allows the number of flowers on each branch to remain fairly constant, irrespective of the degree of branching (Fig. 5). The characteristically bright yellow flowers of the cultivated tomato usually have five sepals (constituting the calyx) and five petals (constituting the corolla) although six or more such segments are possible (Fig. 6). The stamens (male organs) are composed of short filaments and enlarged anthers, which are united in the form of a narrow-necked cylinder (anther tube). The style, which is part of the pistil (female organ), is usually shorter than the anther tube, and therefore the pollen-receptive stigma is enclosed within the anther tube. This ensures self-pollination because the pollen is shed from inside the anther tube (Fig. 6). The importance of self-pollination is exemplified by the fact that when light is at low levels and the style becomes longer than the anther tube, fruit set is greatly reduced. Fig. 2 Cross pollination of two tomato parent lines for the production of Fi hybrid seed. 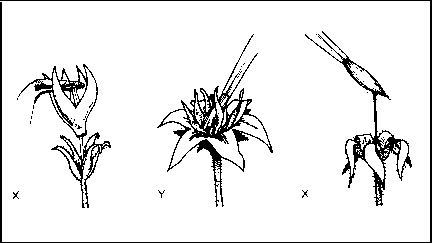 Cross pollination requires the removal of the anthers of parent X before pollen is released. The Y parent's anther tube is opened when pollen is present. The pollen is picked up with a soft brush. The pollen is deposited on the stigma of parent X. The seeds from the resulting tomato have characteristics of both X and Y. Fig. 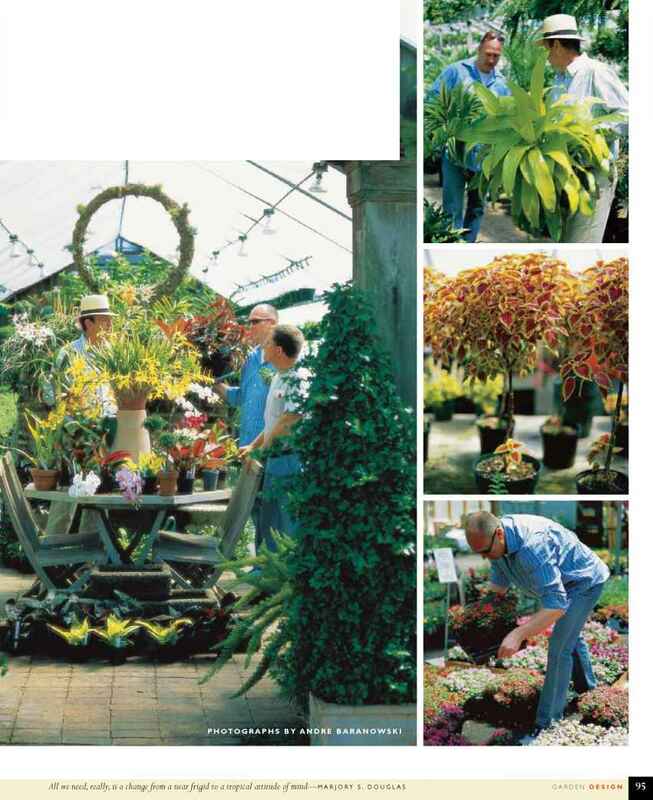 4 The sympodial type of growth of the indeterminate tomato grown commonly in greenhouses. Fig. 5 The flower cluster of tomato. Fig. 6 The flower of the tomato and its pollination. Tomato flowers are complete, with both male and female organs, and are mostly self-fertilizing. When fruit fails to set, blossoms separate at the abscission layer and then drop. Pollination: Pollen grains are released by the anthers. Some fall or float in the air to the stigma, usually of the same flower, where they adhere to the sticky surface. 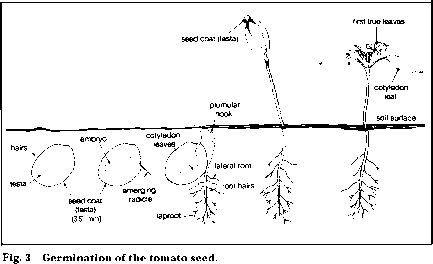 Fertilization: The fruit is set when pollen grains germinate and send tubes with the pollen tube nucleus (sperm) down the style. There they unite with the ovules, in the ovary. Fig. 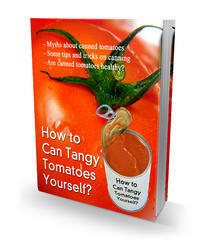 7 The tomato fruit.